Oooh, good picks! I haven't heard of most of them, but I did just download THE CHAOS OF STARS from Edelweiss. I'll have to get THE LORD OF OPIUM, too, as THE HOUSE OF SCORPIONS is one of those books that really stuck with me. And, wow, how did I not know about the CODE NAME VERITY companion book? That's a total NEED. Thanks for the head's up. AND thanks for telling me Edelweiss had Chaos of Stars - I've just downloaded it. :) I nearly wet myself when I saw CNV had a companion book! Oh my! So many good books! I'm waiting for Maggie's and Rae's books, certainly, but also Sarah Beth Durst's new one--CONJURED. I'm really looking forward to The Hero's Guide to Storming the Castle too! Also, Unnatural Creatures: Stories Selected by Neil Gaiman. Those are both coming out in April. Then there's (of course) Divergent 3, Siege and Storm, Crown of Midnight, and Across a Starswept Sea. I haven't read The Peculiar, but it looks interesting! I totally had a freak out moment (it would be entirely within my realm of sanity to forget what month it was :) but I understand why you said it! The new Neil Gaiman! Divergent 3! (Can we get a title already?) Across a Starswept Sea (I mentioned that in an earlier post, so left it out on this one, but SO excited)! So many I forget. The September ones are especially wanted by me, and by then I will have read every book on my tbr pile and can enjoy these wholeheartedly! Maybe. Ah, sorry. I realize that many of the books you're looking forward to come out in September. Sorry about that. How have I not heard of Rose Under Fire yet???? Going to add it to all my lists right now. I know! I wish I remember who had brought it to my attention. I'm excited about the Hero's guide to storming the castle. I'm currently reading The Hero's Guide to Saving your Kingdom to my kids and we all are enjoying it very much. I keep hearing my 9 year old son quoting from the book at random moments throughout the day. 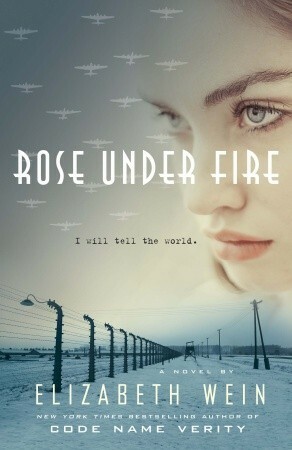 Also, very excited for Rose Under Fire (which I hadn't heard of until I read this post) and I NEED The Bitter Kingdom RIGHT NOW! And Divergent #3 (Alegiant) of course. I bet that is an AWESOME read-aloud! And yeah for Divergent 3 finally having a title! So many fabulous books coming out.